Transparent Matter (feat. Ken Edmonds)from Bruce Mack's forth coming digital album "Lo-Fi Exploits of a MisPlant on Shaolin". Other Tracks: 1. ALL THAT GLOOM: Written by Bruce Mack & Ken Edmonds. K. Edmonds - electric bass, B. Mack - voice, Udo (African water-drum), electric piano & Synth. 2. TRANSPARENT MATTER: (Duet with Ken Edmonds) Written by Ken Edmonds & Bruce Mack. B. Mack- voices & piano, K. Edmonds- Guitars & Electric Bass. 3. GEESE NAPPING ON SHAOLIN: By Bruce Mack - solo piano. 4. DOUBLE 0 NOBODY: Written by Bruce Mack. B. Mack- voice, keyboards. 5. YOUR CALL: Written by Bruce Mack. B. Mack- piano & voice. 6. 1st TRANSFORMATION: Written by Bruce Mack & Rene Ojeda Rodriguez. R. Rodriguez- upright bass, B. Mack-voice, piano, and synth bass. 7. DON’T LOSE SIGHT: Written by Bruce Mack. B. Mack- voice, bass, and keys. John Purvis- guitars. 8. GEESE NAPPING ON SHAOLIN (Reprise). 9. SOME KIND OF FRIEND: Written by Bruce Mack. B. Mack- voices, electric bass, marimba, and piano. 10. 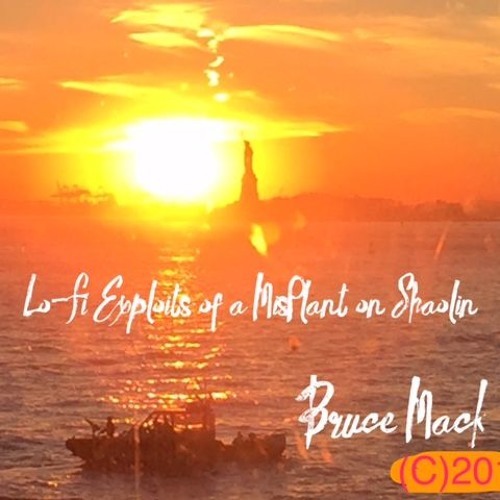 ROUGH & UNFOCUSED AT TEN-58PM: Written by Bruce Mack. B. Mack - programming, piano, synth bass. 11. TRAVEL WITH NO HATE: Written by Bruce Mack. B. Mack- voice, keys, synth bass. Note: "Transparent Matter", "All That Gloom" and "No Regard" were partly recorded at Stan Brown’s (aka BourbonHead) studio in Bedford-Stuyvesant, Bklyn. Everything else recorded at B. Mack’s low fidelity home studio on Staten Island.